This is Yellow fin tuna loin, from Spain Salted and Air dried. We import only the highest quality from Tuna under 150kg. 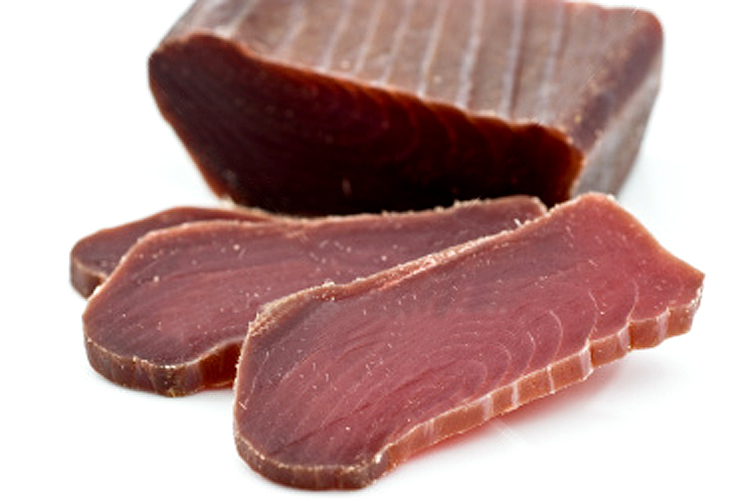 MOJAMA Mojama comes from Murcia on the Costa Blanca in the south of Spain. As they have done for centuries, fishermen catch the Yellow-Fin tuna from the shores of Greece to the African coast. In ancient times, the expression “salted fish” was a synonym for “salted tuna fish”, as it was the fish that was usually salted. During that period of history, the tuna fish was the “king” of the salted fish products, sharing its prominent role with the salt-preserved sardine to the detriment of the cured. The City of Tunis derives its name from Tuna where tuna has been caught and a part of the daily diet since the city came into existence. The word “Mojama” comes from the Arabic word “mussana” (dried meat), and it is a participle of the verb “samma” (dry). During the Middle Ages, “Mojama” was known as “tonyina de gerra” (“gerra” means large earthenware jar), as it was transported in such jars. Mojama is one of the favourite tapas and entré dishes in the south of Spain. 1.-Quartering and sectioning of the caught tuna fish in a special room for such handling, where the different fish parts are extracted by a crafted cutting technique. 3.- Pile salting: The loins are piled up on each other, alternated with layers of marine salt, in sinks, and drain for 24 to 48 hours. 4.- Washing or desalting: for several hours, with water renewal. 5.- Standing: with an optional preserving. The strips are stood one pieces of damp wood until they are of a suitable consistency. 6.- Drying: A two-stage process: firstly the salted strips are placed upon trays until they became firm enough, then they are hung for a few days to finish the drying stage, depending upon the size and the thickness of the piece. They remain so until “the an expert salted fish producer”. 7.During this curing stage, the temperature and the relative air humidity should be controlled. The present-day drying chambers allow such conditions to remain constant. 8.- Cutting: Any rough corners or irregular pieces are removed from the Mojama so that it has an even, rectangular aspect. MOJAMA APERITIF (TAPAS DE MOJAMA) It is the unquestionable “queen” of the Mediterranean aperitifs, it is served sliced, finely sprinkled with olive oil, served with fried almonds and a good sip of beer, dry sherry of white wine or a cup of fine cava to make its taste seem mellower. MOJAMA IN SALADS OR WITH BREAD AND TOMATO: Spread ripe tomato and chopped raw garlic over the surface of a fine slice of bread, and place a fine slice of Mojama on top. 100g dried, salted tuna (Mojama). 200g freshly toasted rounds of bread. 1 large ripe tomato finely chopped or in blender. Olive oil and a little chopped parsley. Mix the tomato, parsley and olive oil to make a thick sauce. Thinly slice the mojama. Place some fresh lettuce leaves as a base on a serving dish. Cover the freshly toasted rounds of bread with the tomato mixture. Place 2 thin slices of mojama on top. Arrange on the dish. Drizzle a little olive oil on top of the mojama. Ready to serve. 100g finely sliced Mojama. 100g finely sliced ling roe. 1 small lettuce. 100g diced fresh cheese. 100g cherry tomatoes. 2 hard boiled eggs, 2 tbsp. capers. 2 tbsp. olive oil. 1 tbsp. vinegar. Make a dressing with the oil and vinegar and add a little alt. Wash the lettuce and slice. Cut the tomatoes in half and the eggs in quarters. Put the lettuce on a serving dish. Add the cheese. Put the slices of mojama in the centre. Place the roe and capers on top. Put alternate pieces of tomato and egg around the edge. 100g finely sliced green peppers. 100 g finely sliced mojama. Cooked rice (suitable for sushi). Wakame seaweed.